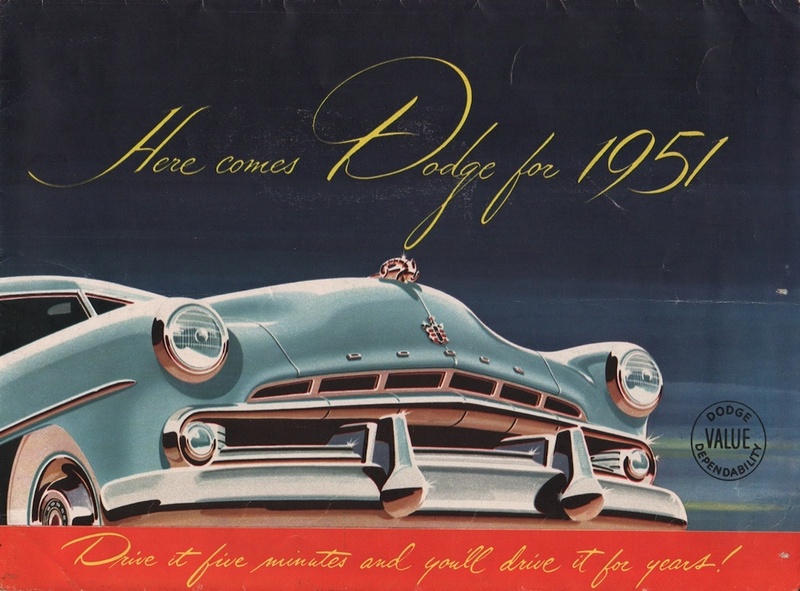 Fold-out sales brochure for the 1951 Dodge. There is a huge 8 page fold out of the Dodge Coronet and Wayfarer group. Specific models included are the Coronet 4 door six-passenger sedan, Coronet Diplomat, Coronet Sierra, Coronet six-passenger Club Coupe, Coronet eight-passenger Sedan, Coronet six-passenger Convertible, Wayfarer Sportabout, Wayfarer 2 door Sedan, Wayfarer three-passenger Coupe, and the Meadowbrook. Both come standard with the 103hp 230.2ci 6-cylinder engine. Brochures are presented for research use only. Company marks, emblems, and designs are trademarks and/or service marks of Chrysler.